Findings: Five Trends Indicate Cross Channel Integration a Mainstay. Super Bowl ads, while only representing the nation’s largest consumer facing ads are a bellwether for advertising trends for the remainder of the year. To best understand these trends, Altimeter Group’s research team analyzed each Ad in real time, and conducted analysis to best understand the advertising trends for 2012. Using Chicago as a middle ground, we reviewed all ads from kickoff till the game clock expired and found that trends out of 87 advertisements. We found that 49% linked to a corporate website URL, also 9% linked to a microsite URL for a total of 57% of all Ads linking to traditional URLs. This standard deployment comes at no surprise, as a call to action is often needed for advertising ROI, and traffic surges are often the most common way to measure this. Surprisingly, despite many game watchers having multiple devices on in tandem to the TV, a whopping 32% did not have any online references to either a URL, or even a social site. In a surprising move, brands did not have a direct call to action. In fact, 32% did not link to any social site or URL as listed in trend 1. For example Chrysler’s Imported from Detroit showed the logos of their car lines, but did not have any URLs. Likely this is due to high brand recognition of brands, and the goal was to drive awareness, consideration –but not drive leads or intent on a website. Why did brands do this? We believe for a few reasons: to drive conversation among friends, or to make an impactful statement, or lastly because we live in a Google world, consumers can readily find URLs without being prompted. We define this instance as Ads that showed their social networking accounts like Facebook, Twitter, or even hashtags in text, or sometimes even written on signs in the ad content itself. 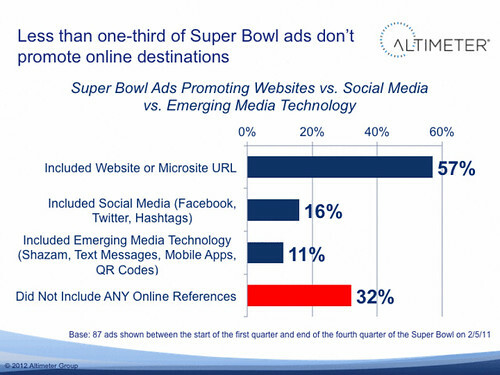 Unlike previous Super Bowls where consumer generated ads were infused with traditional ads, we saw less than expected integration of content from the crowd. This year, we didn’t see any explicit mentions of content that was created by the crowd. Furthermore we found low integration with social media, in fact, 16% of brands linked or mentioned their social networking accounts. Among them 11% linked to Facebook, 2% to Twitter. We did not capture any integration with Youtube, Linkedin, or Google+. Despite the low explicit mentions of social in the Ads, nearly all of the ads are cross-posted on YouTube. While Twitter helped to promote their platform with the Twitter Ad Scrimmage (which lists more hashtags than we saw in-Ad), we found that 6 ads explicitly promoted hashtags (total of 7%), and only 2 brands promoted their Twitter accounts (2%). Interestingly, when hashtags were deployed, we found that traditional URLs nor a request to fan or follow. To highlight, General Electric’s Ad focuses on how their technology is a key component of the beer value chain, pointed only to a hashtag “#whatworks” rather than promote a URL or a social networking account. I asked GE’s Twitter account why they did this and they responded to me in Twitter “@jowyang It’s all about shared conversation tonight (and tomorrow). We want to hear from people. #whatworks” This sea change in tactics is an indicator of how brands want to extend the experience beyond the expensive 30 second Ad to an ongoing permanent discussion. Additional hashtag engagement was found by Budweiser pushing #makeitplatinum (in two ads, by our count), Audi’s #SoLongVampires, Best Buy’s #betterway, and underwear line using #beckhamforhm. These investments appeared to pay off as both Budweiser’s “#makeitplatinum” and Audi’s #SoLongVampires became trending topics minutes after their ads published, there was no indicator that either were sponsored. Beyond promotion the traditional website, microsite and social media account, brands have started experimenting with promoting new forms of marketing engagement for a total of 11% total incidence. To extend the experience, 3 ads promoted applications (often showing on an iPhone like Citibank’s Ad), 3 promoted SMS interaction, and GoDaddy promoted a QR code. We found that brands were integrating Shazam, a music finding application. In particular, Elton John in an Q1 Pepsi Ad was the first to promote this integration, encouraging further interaction by downloading media. Although not emerging, in the traditional sense, Etrade even promoted their phone number, which likely drove direct engagement. Brian Solis notes that this extends the experience and audience now becomes more engaged by downloading and consuming media beyond the game day. A majority of efforts had a focus on making a market impact by asserting new positioning, and linking to traditional websites and microsites. Unlike previous years which pushed CGM in Ad content, or a direct push to fan and follower, brands in 2012 were more focused on engagement in social media, extending the life of the campaign. A set of brands didn’t promote any cross-channel engagement, instead focusing on a powerful message, which we should expect to be a trend as brands can be found in every channel, esp aided by search. New forms of marketing are emerging that result in integrating data from applications, as well as mobile experiences, that we’ll continue to see pioneer through the year. Altimeter Group, a research advisory firm, had a team of researchers including Jeremiah Owyang, Zak Kirchner, and a third party oursourced resource for independent data collection take note of each advertisement and notate if they linked to a URL, (corporate website or microsite) mentioned social media, or used other tools in the Chicago area, which is mid-country. Secondly, Altimeter retrieved a list of brands that were advertising and was able to retrieve Facebook fan and Twitter follower numbers in order to compare pre versus post (stay tuned). 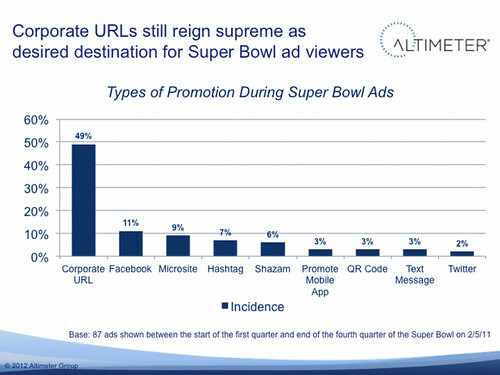 Scope of ads captured were post-kickoff, to end of game when game clock expired. We did not use ads mentioned by NBC during the game highlights. We found that some ads were localized for the Chicago market vs other markets, however the ratios and trends cross-country are likely accurate. In the spirit of Open, we’ve made the data public on Google Sheets. Update: AdRants has commented on the data. Update: This data mentioned on USA Today. Good afternoon! My name is Mitch Canter – I guess you could say I’m the wrench that keeps the Web Strategist blog ticking behind the scenes with updates, changes, and new eye candy. It’s been two years since we launched the current version of the site, and Jeremiah and I are beginning talks to move this site into a new version. New features, a new design, and some new elements to keep you guys (the community) going. That being said, we’re asking for your suggestions as to what you think the site needs. We’re looking for ideas that will 1) enhance the community, 2) provide new and exciting features, and 3) allow the easiest access to the main show here: the content and discussions. We’ll be taking suggestions for right around a week, so leave your thoughts in the comments below. I’ll be monitoring things and discussing the various ideas with you, and once we’ve compiled our data (and Jeremiah’s thoughts on the site as well) we’ll give you a game plan. This next month is going to be teeming with new ideas and cool features, so stick around!